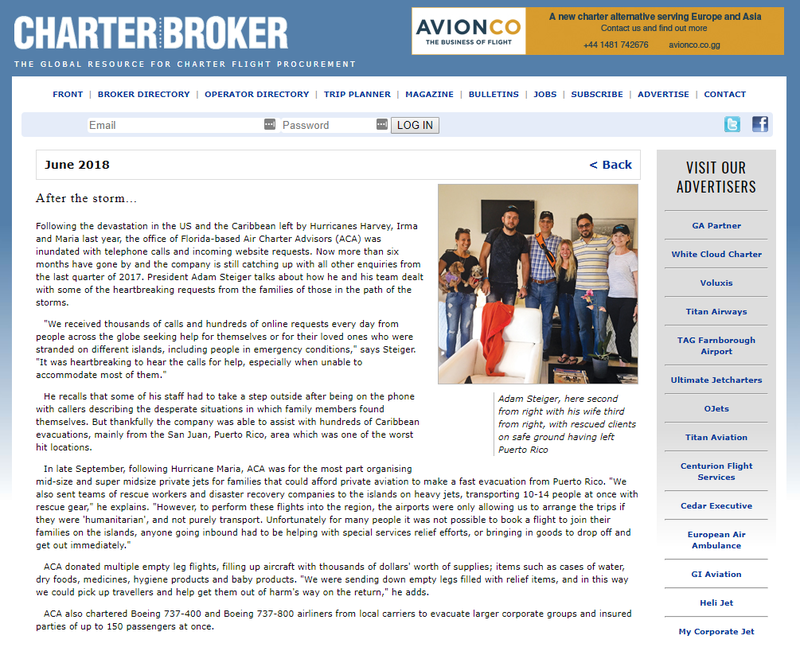 Check out our feature in the latest issue of Charter Broker Magazine! During last year’s Hurricane Season, our Puerto Rico air charter team was able to arrange evacuation flights on private planes from the Caribbean Islands hit hardest by Hurricanes Irma, Jose, and Maria, especially the island of Puerto Rico. As the #1 website for private air charters to/from the island of Puerto Rico, our team received thousands of phone calls and requests every day, from residents on the island, to family members in Florida, New York, and across the United States searching to find a solution. Passenger flights, including private air charters, were suspended following Maria. However, our company donated relief items including bottle water, food, medicine, and more to qualify as a “humanitarian flight”. In order for us to qualify, we had to donate the first-leg to the island, filling it with goods in order to fly into San Juan. Once the aircraft landed and our goods were unloaded, we were able to safely evacuate individuals, families, and corporate groups. We were one of the first private jets to fly to/from the island following the storm, and once we knew what was required for the first flight, we arranged a number of evacuations, getting hundreds of people off of the island.